3 Lions Spotted at The Lion Safari in Nahargarh Biological Park, Jaipur, Rajasthan. Nahargarh Biological Park or Zoological Park or Zoo Part of Nahargarh Sanctuary is located about 12 km from Jaipur on Jaipur-Delhi National Highway 8, 2km away from Amer Kunda crosing. Nahargarh Biological Park started in June 2016 basically the animals from Ram Niwas Bagh Zoo or Jaipur Zoo had got shifted to Nahargarh Biological Park with some other animals under an exchange program. This thing gave better living caged conditions to the captive animals which are there for the stupid entertainment of cruel insensitive humans. 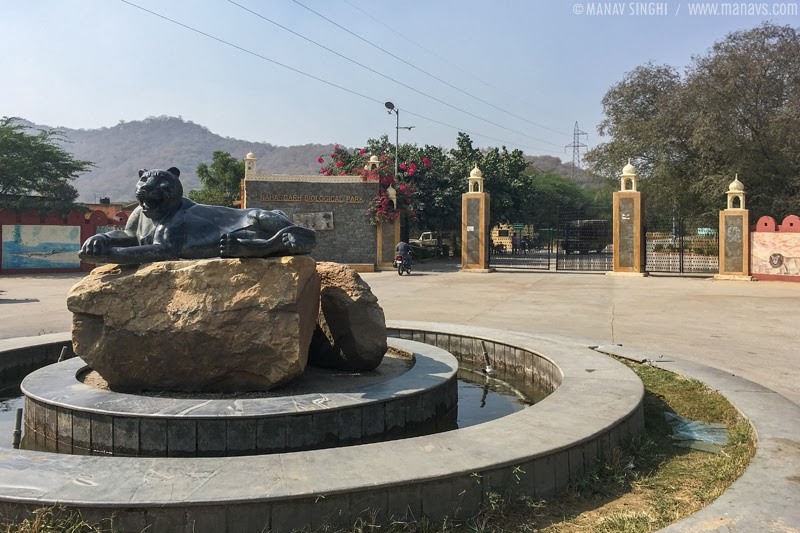 The Nahargarh Zoological Park houses animals such as Asiatic Lions, Bengal Tigers, White Tigers, Panthers, Hyenas, Wolves, Deer, Crocodiles, Sloth Bear, Himalayan Black Bear, Wild Boar, etc. The Lion Safari at Nahargarh Biological Park started from April 2018. Lions in this park were brought from Junagarh, Gujarat under an exchange program. Right now there are 3 Lions at the Lion Safari area and 7 more are expected in few months. Nahargarh Sanctuary is also famous for Bird Watching and Bird Photography, there are around 285 species of birds which can be found here. The Nahargarh Zoological Park is open from 15th March – 14th October between 8.30 am to 5.30 pm and from 15th October – 14th March between 9.00 am to 5.00 pm. It is closed on Tuesdays so make sure you plan your visit accordingly. Ticket Charges for Nahargarh Zoological Park - Indian visitors: 50/- per person| Foreigner: 300/- per person| Student: 20/- per student. Car/jeep: 300/- per vehicle| Motor cycle: 30/- per vehicle| Auto rickshaw: 60/- per vehicle| Bus: 500/- per vehicle. Camera (Indian): 200/- | Camera (Foreigner): 400/- | Video Camera (Indian): 500/- | Video Camera (Foreigner): 1000/-. The Best Time to Visit Nahargarh Biological Park is the early morning. At the morning time you can sight the animals roaming around. Otherwise in the day time as the Sun gets on top most of the animals go in the shade and relax. for the Nahargarh Zoological Park best way is to park your vehicle at the parking area near the Ticket Window and take an Electric Rickshaw which will take to the main entrance gate of the Nahargarh Zoological Park. The best time to visit Lion Safari is also in the morning, in the morning you have the best chance to sight the 3 Lions in open and together. But a Lion Safari Canter needs minimum of 12 booked seats before it starts so either go in a group or you have to wait for Canter to fill in. On the Whole a Good place for Kids. Nahargarh Biological Park Main Entrance Jaipur, Rajasthan. Electric Rickshaw at Nahargarh Biological Park Jaipur, Rajasthan. Group Selfie while sitting on the Electric Rickshaw at Nahargarh Biological Park Jaipur, Rajasthan. Main Entrance of Nahargarh Zoological Park or Jaipur Zoo, Jaipur, Rajasthan. At the Main Entrance of Nahargarh Zoological Park or Jaipur Zoo, Jaipur, Rajasthan. Wolf at Nahargarh Biological Park Jaipur, Rajasthan. Jackal at Nahargarh Biological Park Jaipur, Rajasthan. In between you will find creative Art work like this Tiger Painting and so on at Nahargarh Biological Park, Jaipur, Rajasthan. Tiger at Nahargarh Biological Park, Jaipur, Rajasthan. Dear at Nahargarh Biological Park, Jaipur, Rajasthan. Beware of Small Cats roaming around free at Small Cat Walk at Nahargarh Biological Park, Jaipur, Rajasthan. 2 Leopards at Nahargarh Biological Park, Jaipur, Rajasthan. Leopard at Nahargarh Biological Park, Jaipur, Rajasthan. White Tiger at Nahargarh Biological Park, Jaipur, Rajasthan. Art Work at Nahargarh Biological Park, Jaipur, Rajasthan. Lion at Nahargarh Biological Park, Jaipur, Rajasthan. For me this much Bird Photography was more than enough. . . :p at Nahargarh Biological Park, Jaipur, Rajasthan. Gift or Souvenir Shop at the exit of Nahargarh Biological Park, Jaipur, Rajasthan. Main Entrance of Nahargarh Lion Safari, Jaipur, Rajasthan. Ticket Window Nahargarh Zoological - Biological Park, Jaipur. Ticket price list Nahargarh Zoological, Jaipur. 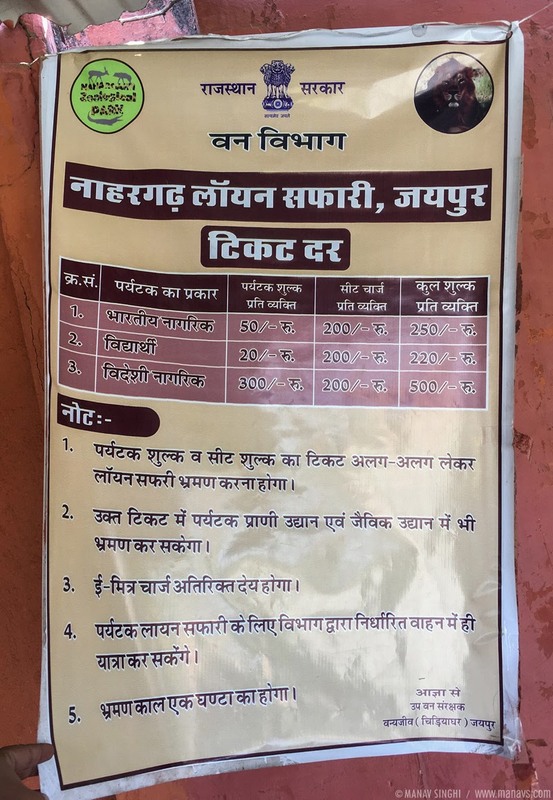 Ticket price list Nahargarh Zoological - Biological Park, Jaipur.